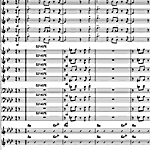 Original charts - vocals, in a range of styles and tempos. A range of original charts - vocals - for big band and jazz orchestra, from the swing era and beyond. They are in a range of styles including ballads, medium tempos, swing and pop rock. They range in difficulty from Easy to Medium Advanced, so please check their individual descriptions for more information. All of these charts are for solo vocalist. For original instrumentals charts please check our instrumental categories. Which charts are we offering to you here? Included in our selection are charts such as "Cry Me a River" - a fine ballad in Julie London style, "Route 66" taken as a swing shuffle, "Jailhouse Rock" in Elvis Presley style, "Help Yourself" from Tom Jones, and "My Baby Just Cares For Me" in true Nina Simone style. All of these charts have been professionally arranged, are easy for your players to read and sound really good in performance.